As college graduates face the worst job market since the Great Depression, some will have to start their careers at the bottom of the ladder. Even with a college degree in hand, flipping hamburgers is a potential job, although not much of a career move. Or is it? For many people, a fast-food job is a memory from high school that they'd rather forget. But for others, flipping burgers was just the start up the ladder in the fast-food industry. From wearing hairnets, washing dishes and cashiering to managing and eventually owning their own restaurant, here are two tales of fast-food workers who turned a job into a career and have some advice for young professionals who are flipping burgers. James Valentine, 54, started at age 16 working at a McDonald's restaurant as a crew person and worked his way up through the system to supervising multiple stores. He left McDonald's after 12 years to become his own boss. 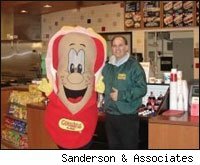 In 1985, he became the very first franchisee for Cousins Subs, a 150-store, Menomonee Falls, Wisc.-based, restaurant chain. Today, Valentine and his wife, Leah, own and operate six Cousins Subs restaurants throughout the Milwaukee metro area. Together the pair have seven children, most of whom work by their side. His advice to people starting in this business is to be humble. "You have to enter the job with the mindset you are there to serve, not to be served," Valentine wrote in an e-mail interview. "This is especially true in the restaurant industry, but is a valuable lesson for people in all work environments. If you come to work every day ready to learn all aspects of the job and to work harder than those around you, with a positive attitude to be the best that you can be, you will get the attention of upper management. They will recognize that you are a results-orientated person and a high performer." He also recommends being prepared mentally to deal with the attitude of people toward "hamburger flippers." "I have seen how this attitude can be an obstacle for some and cause them to stumble or feel inferior to those expressing such an arrogant attitude," he wrote. "Remember you are there to SERVE, so be humble. Have a 'servant's heart' and you will learn to not let that affect you. As you climb the ladder you will see that this is part of your on-the-job education." Steve Bohn, 38, has worked in the restaurant industry for more than 25 years. Starting out as a busboy at 13, Bohn worked his way up through the system to grill cook, shift leader, kitchen manager and eventually general manager. He worked in the kitchen until 1997, when he was promoted to the floor. In June, Bohn and business partner Forbes Watson opened Newk's Express Café -- an express casual dining franchise with more than 25 restaurants in seven states -- in Farragut, Tenn. Bohn is the operating partner, running day-to-day operations. He and Watson plan on opening two additional locations within the next 18 months in the Knoxville metro area and a total of five locations within the next five years. Bohn's advice to workers starting out by flipping burgers is good advice to anyone starting in any business: learn without being asked. "Move yourself around and lend a hand in areas that may not be your responsibility," he wrote in an e-mail interview. "Remember that the more you know, the more you're worth. When I'm hiring young adults, initiative is the No. 1 thing I look for. You have to be someone who is a team player and ready to wear every hat." People skills are important, both with customers and employees, he said. 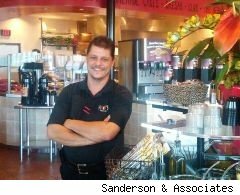 "You gain many loyal customers because of the people who serve them on each visit and the personalities in your restaurant," he said. He stays in the business because each day is different. "When you come in to work every day, you never know what will be thrown at you that day, but this business has forced me to become quick on my feet and learn how to come up with solutions to every problem imaginable." The good news, as Bohn points out, is that restaurants are always hiring, and eager people who learn everything they can about the business can turn flipping hamburgers into a rewarding career.